The deer are happily wandering the mountains these days, seeking the food that abundantly grows all around them. They especially love my hanging bird feeders—it’s fast food for them! They just knock the bird feeder about and then eat what falls to the ground. Or they go to my bird feeder boxes, and eat the seed from there. 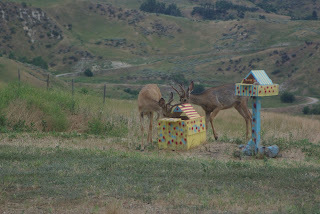 One buck in particular had a hard time getting his head into the box—those four point antlers kept getting in the way! The wind knocked one of my hanging feeders to the ground. How does a deer get the seed out of that? Stomp on it. The deer got the seed and I had to replace the feeder. In the winter, the bird feeders are even more attractive to the deer. How hard is it to knock about a feeder or stick one’s head into a box, as opposed to pawing at the snow and trying to find some forage beneath it? 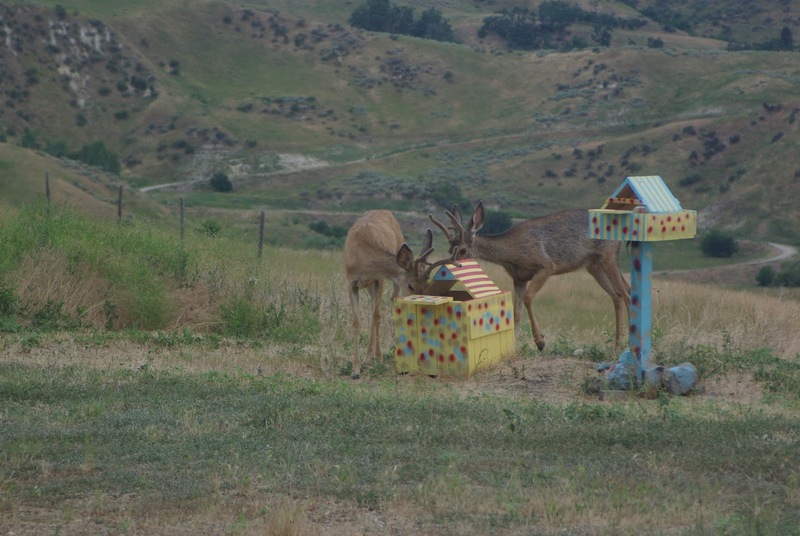 Then I got the brilliant idea to fill the bird feeder boxes with something the deer would like—to help them through a long winter. Then I read an article in our local paper that said DO NOT PROVIDE FOOD FOR THE DEER OVER THE WINTER. Bummer. At first, I thought, wow that’s harsh. The females are struggling to find food for themselves and their babies who were born late in the fall, so why not help them along? But the article made a very telling point: if you feed them in the winter, the females then do not teach the younger deer how to paw through the snow to find food, and the little ones don’t learn this survival skill. 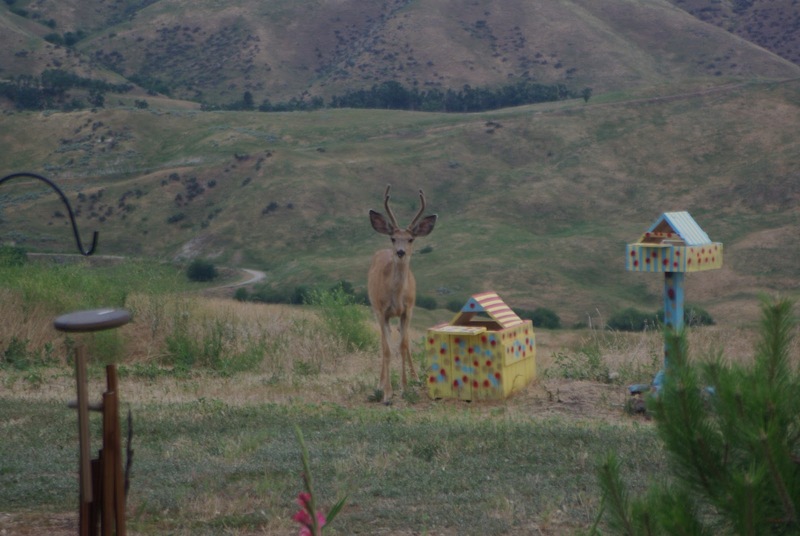 What if a deer cannot find your feeder? Or it’s empty? The article said it’s simple: the young will starve to death—not because there isn’t any food available to them, but they don’t know how to find it under the snow. How often do we see a person standing with a sign, asking for money, and in trying to be compassionate, we give them some cash? Or someone wants something from us, and instead of showing that person how to accomplish the task, we simply do it ourselves, and then wonder why this person keeps coming around, asking for more. We need to have two characteristics to navigate this idea of Christian charity. We must have both compassionate maturity and mature compassion. Compassion, just by itself, may cause us to inadvertently do something that is contrary to a person’s welfare. I want our deer to survive the whole year, but my compassionate placement of food for them may actually cause harm by making them dependent on me for their survival, instead of the provisions that lie beneath, under the snow. Now, combine the two: wisely discerning the real need of someone, based on experience, can lead us to provide the best possible response. We can see cause and effect in someone’s choices, and we share what we observe with compassion and not judgment. We still may not act—it may that person’s responsibility to act, just as it is the mother deer’s responsibility to prepare her young for the winter. It is not the summer hills that test who we are, but rather the winter snows that show our character. If we provide the “food” and not the “how to” to find it, we might actually be making things worse for someone, despite our best intentions. And worse still, we might be stepping in when that person should be turning to God—He is, after all, our ultimate Source and Provider. Father of All: Help me to be compassionately mature as I face the hungry “deer” around me, and to respond in a way that reflects Your love. Help me to see to the real point of need, and not just act in a way to makes me feel better. Let me be Your hands and feet, walking in maturity as I grow in You. In the name of the One Who is Our Source, amen.